Welcome to Week 6 of Year 5 here at PPF! Random.org this week chose #42 - Anthony Billings. 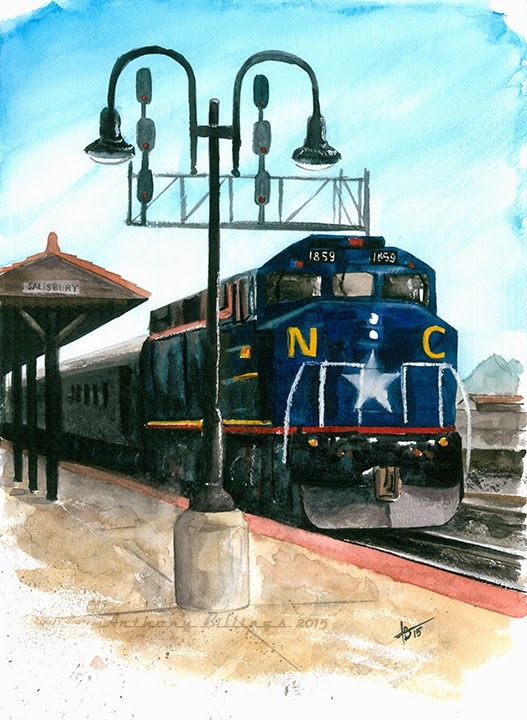 A moment of serendipity led to Anthony capturing "The City of High Point" in a photo that he has since turned into this wonderful watercolour painting. Not only is it the name of the train but also of the town of his birth! Anthony is an outstanding artist. All his work is fabulous. Congrats Anthony. Happy PPF to everyone. Very cool watercolour! A talented man to be sure!! wonderful work from Anthony! His work is so realistic. Great work Anthony love the way you captured the train. Fabulous train watercolour, well done! Such a great painting Anthony! Happy PPF to all! Wow! This is such a wonderful painting. Nice watercolor! Happy PPF to everyone! It is a really beautiful painting!! What a gorgeous painting! I love seeing the art here. Happy PPF! Thank you all so much! Thanks also for the feature! p.s. my link isn't working but I don't know how to delete it and re-enter it. Apologies for anyone who's tried to link... here's one that works! Thanks for this delightful party.